07-Jan-2006 -- I tried this, my first visit to a confluence point, last week. It was a beautiful day but severely underestimated the amount of time it would take to reach the point. So I turned around, determined to make it back. Today, again with pleasant weather, I made sure I had plenty of time and water. I started my quest in Beaumont, TX, about 15 miles away. Traveled down Hwy 347 in Nederland until I reached the sign indicating the remote control airfield. Walked past the airfield and entered into the thick unknown, about .3 miles from the point. I read the earlier visits which stated the area was in a pretty heavy swamp. However, since it hasn’t rained in this area for about 2 months, a pair of tennis shoes was sufficient. There were sections of the walk that were extremely heavy with reeds. In those areas, it was incredibly tiring to make any significant progress. It was also tricky traversing the more wooded areas since the majority of the trees were downed from recent Hurricane Rita (approx 3 months ago). Nonetheless, I believe the trek was a bit easier than it would have been in any other season. 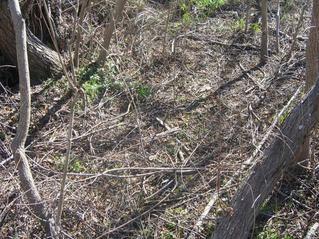 As you can see in the photos, much of the vegetation either was dormant or dead. I was slightly concerned about spiders, alligators, snakes, etc., but saw none. Although there were no mosquitoes, I did lose a fight with a pile of fire ants. I stayed at the confluence point for about 45 minutes. Most of the time was spent trying to both find the precise point on the GPS and taking a quality picture of the GPS at the same time. After several attempts and photos, I finally captured the precise point, with my GPS indicating accuracy at 11 feet. The GPS altimeter indicated the altitude at 1 foot above sea level. I did receive a phone call near the confluence point and had good reception. It became clear why this point hasn’t been visited often. Although not far from a main road, it was certainly a struggle. And as I said before, I probably had the perfect climatological conditions (not much water in the swamp, about 65-70 degrees, the least amount of vegetation possible, no spiders/other critters). For future visitors, I would recommend long sleeves (to spare your arms from the reeds/vegetation) and work gloves (to work through the reeds). On the way back, I took a slightly different route. It was shorter, but the reeds were taller, deeper and thicker. It took about the same time to reach the clear area near the remote control airfield (about 45 minutes to an hour). This was a great confluence point initiation. I’ll look for an easier one next time.